ROME — Pierpaolo Campostrini waded through St. Mark’s Basilica, his tears joining the rising waters of the flood. 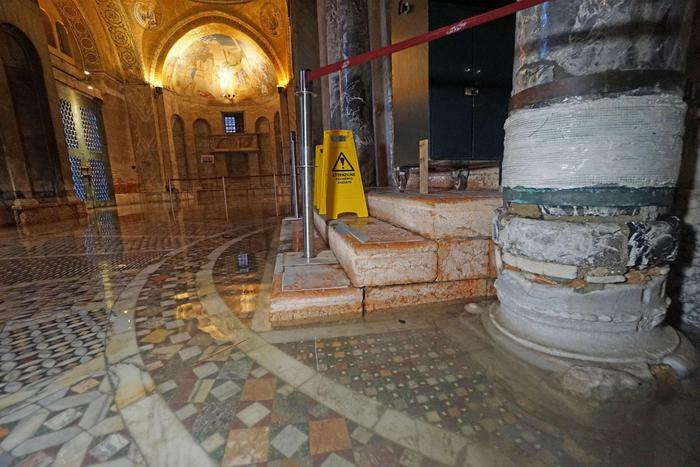 Although the Venice native had seen plenty acqua alta, this time was different: there was three feet of salt water covering the 1,000 year-old mosaic floors and crumbling the marble columns. He vowed to do something to keep it from happening again. Campostrini is the director of CORILA, a consortium of groups studying the Venice lagoon in hopes of saving it, and sits on the management board for the Basilica. He told the story of the moment it hit home that prevention was just as important as recovery at the recent European Forum for Disaster Risk Reduction. The three-day conference held in the Italian capital gathered 800 participants from 50 countries, including representatives from the Caucaus region. • Restore the possible — but include prevention in the budget. The Basilica team is now focusing on devising ways to pump water out the next flood but there may be ways to work with the Mose floodgates to prevent the water from coming that far into the church. • Use each event as a learning tool and apply those lessons as quickly as possible. The last 100 years have radically altered the shape and ecological makeup of the lagoon, researchers who have mapped the area say: for starters, salt marsh areas shrunk by half and underlying sediment has radically shifted. The “floating city” already struggles to stay above water in the spring and summer floods and relative sea level rise is expected to increase their frequency. “It’s a process that will continue forever,” he says.